Lion's Eye for Gamelan was commissioned in 1985 by Barbara Benary for Gamelan Son of Lion. Lion's Eye for Synthesizer was commissioned concurrently by Neil Rolnick for iEAR Presents at Rensselaer Polytechnic Institute. Both versions were performed in 1985. The intention to combine both pieces in order to expand the tempo range of the Gamelan was first realized in May of 1989 in performances by the Berkeley Gamelan in Oakland and San Francisco, California under the direction of Daniel Schmidt. This version of Lion's Eye is recorded on this disc. The duration of "Lion's Eye" is forty-five minutes. 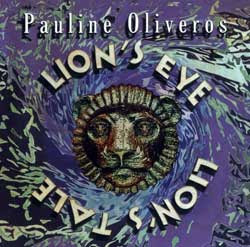 "Lion's Tale" (1989) is composed of layered polymetrical, polyrhythmical patterns. The patterns are played at speeds ranging up to 1800 per minute. The composer designed patterns are generated by the computer program. "Lion's Tale" may be created in a new version every time the program is run. "Lion's Tale" also exists in a MIDI version for a keyboard performer. Both versions are available from Deep Listening Publications. Known internationally as a composer, accordionist and teacher, Pauline Oliveros's work in improvisation, electronic techniques, teaching methods, myth and ritual, and meditative and physical consciousness raising has changed the course of American music. She left the University of California at San Diego in 1981, at the rank of full professor, in order to support her ideas, creative projects and collaborations. All of her work emphasizes attentional strategies, musicianship and improvisational skills. Oliveros' compositions have been performed worldwide. Pauline Oliveros has been in my mind since the late 1980's when I started to listen to music in general and I came across some american avant composers. What I really liked about her approach to music was not only a kind of virtuoso background but a really coscious choice to become a really virtuoso listener which was surprising as a general hint to music which I had at that time. Music is a co-operation between a listener and a maker. I had this motto in my mind today when I received a parcel from Pauline. The music here is so rich, so extensively meditational in a sense that all the new age gurus wouldn't dare to swallow and at the same time so intimate so feminine. What I mean is the deeper you go the more you get and the flow of the energy has a really great sustain. The composer's idea to blend gamelan music together with textures of digitalised textures gives a really refreshing tone to the meaning of music itself. Dig it! w przypadku wielu recenzji przydaloby sie podanie nosnika - CD, CDR, kaseta, winyl. wiem, ze w niektorych są.